The installation is now open to the public, responding well to the presence of people in the space. Thanks to Yukio, Laure, Jonathan, Shugo, Eiko, Hannah and John who all helped make it happen. Yukio Fujimoto's performance was fascinating, he consistently creates an atmosphere of concentration and extreme focus which is very unusual, especially with what I'm guessing is an English art audience. Some of this atmosphere is perhaps brought about by the physical scale of the work - everything very small so people have to be quiet to listen - beeping calculators used in a virtuoso way never intended by the manufacturer, a tiny electronic noise maker, the page of a magazine. Finishing dramatically with a large sheet of paper activated by hand operated massage machines - much more impressive than I can describe. Then across London to see another artist who often makes work on a very small scale but in a very different way - Rie Nakajima performed at White Cube - she created a spatial sculpture amongst the sizeable audience - the event also involved an unusual level of concentration. Opening tonight, I hope this to be a situation able to accommodate many levels of listening attention without enforcing one in particular. After the opening this fine ambition has been moderated by reality. Optimistically I had thought this particular work could survive the amplitude of sound in the space at the opening but I severely underestimated the effect of the absortion of room reflection by human bodies. 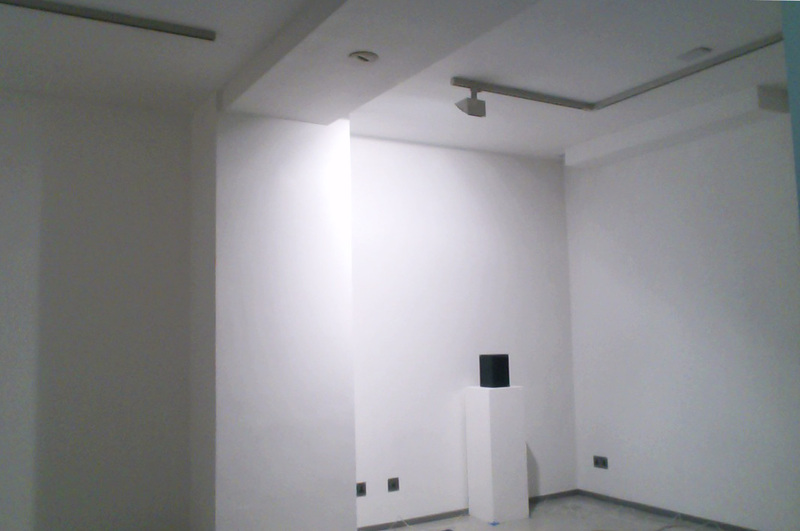 After 20 people entered the space the sound of the work became inaudible. What many people witnessed was a room full of people talking, not so different to many art events. I was reminded of the very first Listening Room at Chisenhale where we had anticipated this to the extent that we didn't have a specific opening event - just kept the gallery bar open each evening. Tomorrow - a performance by Yukio Fujimoto - his first in London. Yukio Fujimoto has more or less finished building his work upstairs. Most of the work involves a series of small music box mechanisms - today I realised that this work and mine have the same quality of overlapping cycles which never repeat. Overlapping more as the sound of each installation leaks into the space of the other. A lot of visitors today and the work is responding well to the presence of people in the space. Most of the day balancing the feedback notes and cycles, sounding good but there is a storeroom door in the space which is meant to be closed during exhibitions. About 18.00 I noticed that I'd completely forgotten this door and had left it open. It has a dramatic effect on the sound and balance, closing the door disrupted the entire installation. Start again. 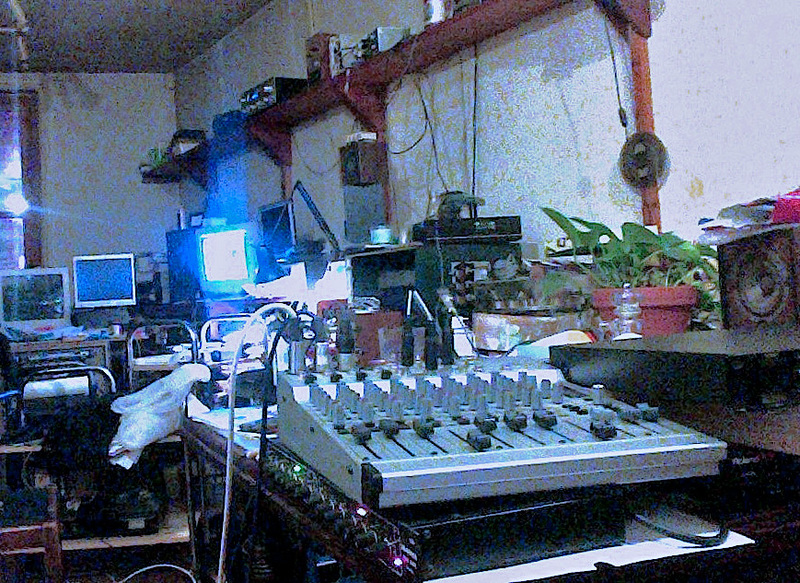 Aside from that, progress today, the sound of the room is becoming apparent. First day in the exhibition space. Although dimensions are similar to my studio the wall surfaces are more reflective and the irregular shape of the south wall is a complex series of surfaces. With the system working in a fairly basic way I walked around very slowly carrying an additional live microphone, listening to the harmonic content of the sound, where the interesting nodes are in the space. One consideration is to use more directional microphones than in previous work and build the sound field around these nodes. A few times the system has worked very well for 10 minutes or so and then for no obvious reason shifts to a sustained low level feedback note. Much to do. Continuing with the test installation, a different loudspeaker and some alternate settings. Only subtle differences audible in the recording but over an extended period it is more robust. The resulting installation will be in place for over a month so within acceptable parameters stable behaviour is essential. Today a test installation has been running for some hours in my studio. I've never been confident to work offsite to this extent with previous installations but on this occasion I'm fortunate that the dimensions of the intended location are similar to my studio. This should be a good basis for what will eventually work in the space. This working version is a double system based on three microphones in the room and two speakers, each fed from different mics individually governed by a noise gate. The two systems are interdependent, working around different frequency areas when the room is empty. It remains to be seen how it will behave with a lot of people in the room. This is the result of weeks intermittently testing variations of the proposed installation which have been running with varying degrees of instability or just not sounding interesting. 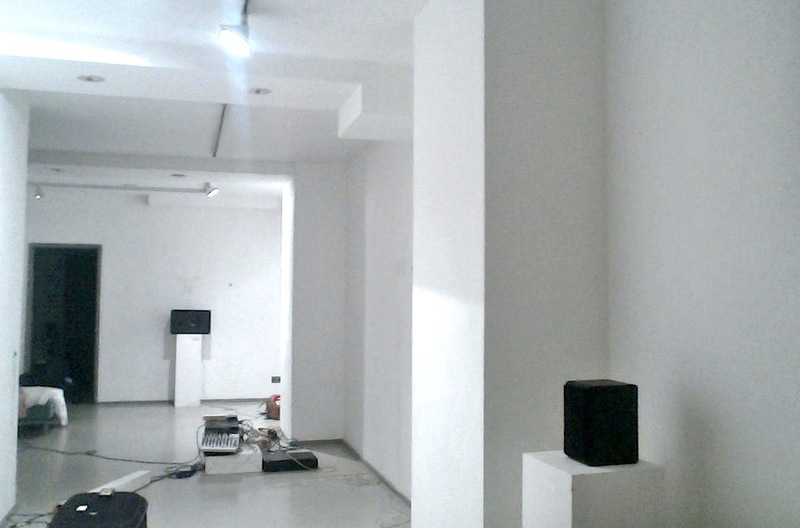 My first works with live room resonance were in significantly larger spaces (Chisenhale, Sydney), where it seems comparatively simple to make these installations behave consistently and reliably. 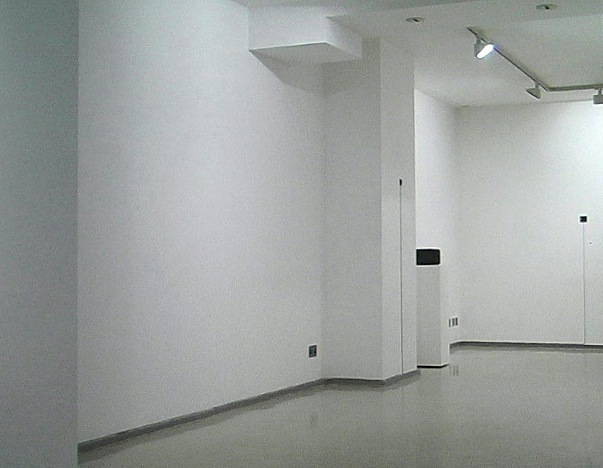 In smaller spaces each tiny variable has a disproportionate effect, in particular high frequency content in the feedback caused by reflections from gallery wall surfaces can become a very uncomfortable distraction from any sense of the overall space.